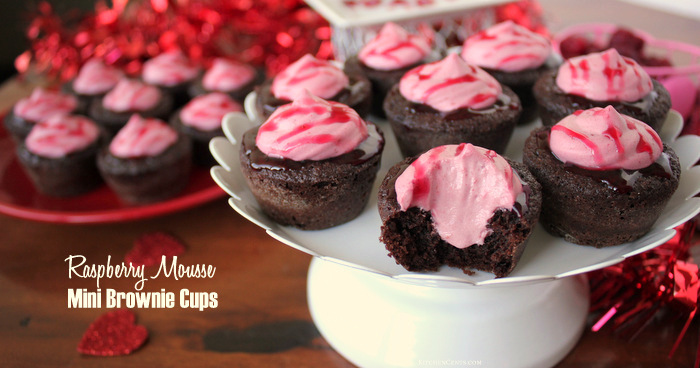 These bite-sized chocolate brownie cups are filled with smooth, delicious, easy raspberry mousse and topped with a sweet raspberry syrup. 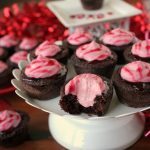 Perfect as a Valentine's Day dessert! Preheat oven to 350' F.
Mix butter cocoa powder, and sugar together. Add vanilla and eggs. Mix. Add flour, salt, and baking powder. Only mix until incorporated. Don't overmix. Scoop (size 70 scoop) 1 tablespoon into each mini cup tin that has been lightly greased and floured. Bake brownies for 14-16 minutes or until toothpick comes out clean. Let cool 5 minutes then push small rolling pin, round tablespoon or other item to make the cup part in the center of the brownie. Remove brownie cups from pan before filling. Put raspberry mousse in ziplock bag fitted with piping tip or cut with 1/4 inch hole. Once mini brownie cups are cooled pipe mousse into cups. Drizzle with raspberry or chocolate topping. Chill for 4-6 hours to allow mousse to set or serve immediately. Best if chilled for 4-6 hours. Best if enjoyed within 1-2 days of making but can last in fridge for up to 5 days. you will only need 1/2 (half) a batch of this Easy Raspberry Mousse. You will find step-by-step directions for the mousse HERE. 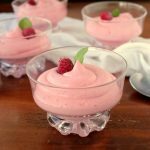 This pretty pink Raspberry Mousse is filled with creamy, smooth raspberry flavors and only takes 4 ingredients. A perfect treat for Valentine's Day! Stir gelatin into 1/4 cup cold water to soften. Set aside. In a small saucepan, add raspberries, sugar and 1/4 cup water. Heat until berries soften and being to break down. Puree in blender. Remove seeds using a strainer if desired. Put back into saucepan. Add softened gelatin. Bring to a boil. Boil for 1 minute, stirring constantly. Remove from heat. Cool to room temp (between 70-80 degrees F.). In a large bowl, whip cream to stiff peaks. This is the stage right before cream turns to butter. Be careful not to over whip. Once berry mixture is cooled adequately, carefully fold into cream. Pour into serving dishes or chill and pipe into serving dishes. Chill for 4-24 hours before serving. This mousse is great on cupcakes. Chill mousse for a couple hours before piping onto cooled cupcakes. These look like they would be perfect for my birthday next week! Yum, thanks for sharing!